We offer our potential customers a free, no obligation site visit. At this point, we are always happy to discuss your ideas, as well as to offer our own if desired. After the initial site visit, we can advise on planning matters, both from a design perspective and in terms of what is possible from a building perspective. We can talk through design options, potential build costs and what our fees would be, should you choose to employ our services. The services we offer are listed below and a synopsis of what is involved can be found by clicking each link. Typically, after discussing your proposal with you at an initial meeting we will then write to advise you of our fees and the points discussed. Should you wish to employ our services we will be ready to take instruction and survey your property. We will draw up plans that illustrate initial draft schemes, these will usually form the basis of discussion at a second meeting where we can talk through the merits of certain ideas and progress the drawings to a more finalised proposal. Once you are happy with a scheme we have developed, the drawings can be completed so that they are ready for making a planning submission or building regulations application when necessary. Once submitted we will liaise with the local authority on your behalf throughout the process and keep you informed along the way to ensure that you are fully aware of any developments that may need addressing. After receiving the necessary permissions and detailed drawings you will be able to approach builders and obtain competitive quotes on a like-for-like basis. This will put you in charge of the process and ensure everything you want can be achieved. The possibility of having your loft converted is sometimes not quite as straightforward as you may think. Although your proposal is unlikely to need planning permission it is still very important to think about its design early on. There is a lot to think about in terms of getting the layout right and complying with all the relevant building regulations. It usually takes a great deal of thought and experience to convert a loft well as there are always implications that need considering. How the new floor is accessed in compliance with regulations and the structural implications of the conversion are just a couple of areas to think about. Once your home has been surveyed and initial schemes have been drawn up, it is usually a good idea to meet up and discuss the proposal. At this stage we can talk you through the schemes if there is more than one and take on board any input you may wish to have. Typically, any issues with the design are finalised at this point, so we can then progress the drawings to the building regulations stage. We will issue drawings with all the technical details on that can be sent to Building Control for their approval and to any contractors you would like quoting for the work. AGD will always produce drawings with a high level of detail ensuring that any technically difficult areas of the build process are thought out first and explained on paper. This ensures that there is a very minimal chance of unforeseen extras being uncovered once building work has started and puts you in charge of the process throughout. 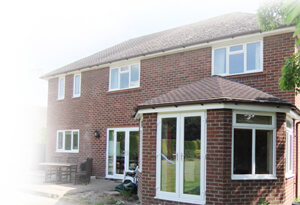 As per extensions, we will discuss what you want out of your new home by creating a design brief. Making a list of features you would like in your proposed house will ensure that a collaborative design can be drawn up and merits or the proposal can be discussed. This will give you a chance to see what your proposal will look like and comment on how you would like to develop the scheme further. We will produce a scheme that you can have as much input in as you like. We will advise on planning matters and ensure every proposal has a high chance of securing planning permission by generally adhering to the constraints of planning policies and liaising with the local authority to ensure they understand why your proposed scheme should be approved. Our involvement in your project may finish at this point if planning permission was sought to simply add value to a parcel of land prior to sale. However, should you instruct us to produce detailed drawings we are happy to provide this service too. Once the drawings are completed you will be able to approach builders and obtain competitive quotes on a like-for-like basis. This will put you in charge of the process and ensure your proposal can be built to a fixed cost or agreed timescale. Although barns suitable for converting are few and far between, we have been involved in many such projects. This really is a specialist area where professional advice and experience can be invaluable. Barn conversions often require creative designs to ensure the internal layout of your proposed home will work well. As well as the design aspect of barn conversions there is more to think about. We will need to submit a plethora of reports and statements to the council to ensure a permission has the best possible chance of being secured. We are happy to look at any opportunity you may have to convert a barn and advise on the best possible way of obtaining planning approval for it. Often very simple and unlikely to require planning permission, we can produce drawings that can be sent to the local authority and your chosen contractors to quote from. We will produce drawings with all the necessary details on to ensure that there is a minimal chance of unforeseen extras being uncovered once building work has started, so that you are in charge of the build process throughout. We will always advise on planning matters at an initial no-obligation meeting and give you a good idea of your chances of securing planning permission. Should a situation present itself where it may be cost-effective to get formal feedback from the planning department about your proposal before putting time and expense into developing a finalised scheme, we will meet with planning officers and discuss the relevant issues on your behalf. AGD will always produce drawings with excellent attention to detail. We will work on an hourly basis or provide a fixed fee for individual work when required to ensure that projects can be completed at a reasonable cost. We are happy to work alongside other professionals in similar disciplines who may need architectural services on a sporadic basis such as planning consultants, developers, structural engineers etc. We will work to a high standard and undertake work such as site surveys/levels, design proposals, 3D sketches or the production of technical drawings etc. We will work in this manner for individual clients who wish to liaise with the local authority themselves or use our services in a different field to architecture altogether. If your company needs the assistance of an architectural practice at busy spells or our experience to diversify the products you offer, we will be able to help and produce drawings in a style consistent with your existing brand image and on your existing drawing sheets.